According to Phil Plait at Bad Astronomy, basic physics has shaped both: Hey Bennu, have we met? I never forget an asteroid. That’s no coincidence! Both are small, with very weak gravity. Both are also rubble piles: Not solid, monolithic objects but instead like bags of rocks held together by their own gravity. Billions of years of slow-speed collisions have essentially shattered them in place. The important bit here is that both rotate relatively rapidly. 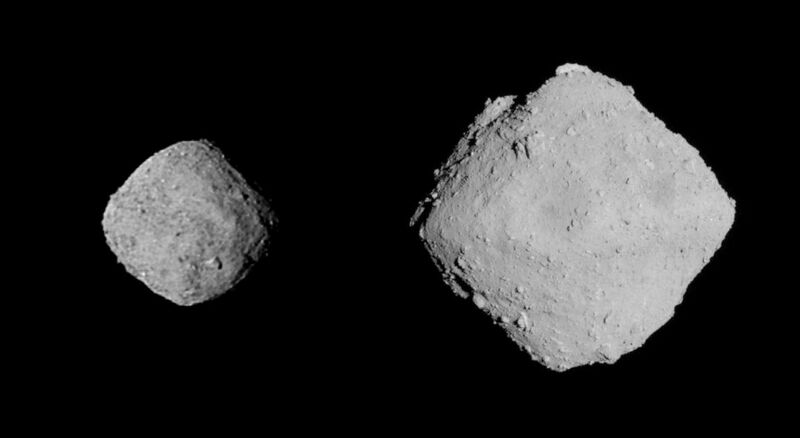 Bennu spins once every 4.3 hours, and Ryugu once every 7.6 hours. That means that a rock sitting on the surface feels a weak pull downward toward the center due to gravity, but also a weak centrifugal force outward, away from the spin axis of the asteroid. These combine such that the equator feels like it’s downhill. It's been a bad couple of week's for NASA. All three missions have been massive successes that ran well past the time they were designed for - but it's still sad to see a string ending around the same time. A research team working on solar sails for Harvard suggested the possibility that 'Oumaumau - our first proven extra-solar visitor, spotted last year - showed similar properties to a solar sail. The claim wasn't peer-reviewed and seemed like an obvious click-bait promotion. However, it does underline one of the particular mysteries of 'Oumaumau - it's apparent acceleration away from our solar system. Some scientists think this was due to gas venting, presuming that 'Oumaumau was a comet - but no comet debris was ever observed. Curiously, I think another article published this week could offer a clue: New insights on comet tails are blowing in the solar wind. Though no-one's apparently made a connection , it might be more plausible to suggest 'Oumaumau contained ferrous-magnetic metals - which might have been given a small kick by our Sun's magnetic field, and therefore explain the change in acceleration. The jury remains out. Warning: some people may be alarmed by the mention of Panspermia! A great series of articles, plenty of good thoughtful ideas to mull through the week. The last thought in the last article is a funny side note for me, "Astrobiologists need to ensure that they are not limiting life to what's already known..." That only brings a smile, could someone who was studying the idea of life transferring between close planets when we know we get hit by stuff from Mars from time to time, push the human first philosophy that far out so as to think that only our kind of life is capable of hitching a ride. I suppose stranger things have happened. White dinosaur eggs might have been the first instant breakfast for a table of five to go extinct, instead of over easy, it was easy pickins. I'd like to see a picture of the Milky Way that pictured the stars by their basic components so we could see all the trailing results of the different collisions. Like their are two types of constellations, one set made of individual stars and the other, big and small streams of a former galaxies. The big one featured in the article is all around us but smaller ones are probably just splashes of color here or there. The star location map done in colors, red closest, yellow farthest comes out backwards for me, my eyes are putting on the optical delusion I see on computer screens where the red is perceived as being behind the yellow, though I normally only see red and doing it. The center line is an open rip that goes all the way through the picture to the far side. No matter what is driving the Oumaumau guy, it's very cool, not slowing down but speeding up as it leaves. The impression is apparently it's not hanging around. Seen it, done it, been there. The idea that magnetic material gave it a boost around the sun is intriguing. Would something like that add to our orbit. If it is solar sailing even by natural shape whose to say it hasn't picked up stuff along the way the same way drifting stuff in the ocean can carry an assortment of life from one side of the ocean to the other picking up stragglers all along the way. I think the asteroids one could be very important for our SF writers. All too often asteroids are simply thought of as giant rocks - but it's clear that some are piles of rubble shaped like D&D dice. Most asteroids seen so far don't have geometric shapes like the current 3 mentioned in the 2 articles. Elongated or normal blob type structures seem to be the norm, like stuff broken off of something. Would geometric shaped asteroids be growing like crystals. Are the asteroids we see normally decreasing in size by losing bits and pieces while these three are collecting material. The Old One may not play dice with the universe but I would say the universe plays dice with life. If it does contain ferrous magnetic metals that doesn't preclude that this is a propulsion "system". I'm not saying this is an extra-solar visitor BUT if it is an extra solar visitor, then surely this sort of accelerated propulsion which essentially just uses external magnetic energy would be a very efficient way to do it. I would imagine something whereby a return trip might be a few thousand years and might use magnetic and gravitational energy for acceleration and maneuvers. For all we know Oumaumau might actually be the home world for an intelligent microbial life - or it might contain data banks and an entire digital civilisation. I really do like these little science round ups you do Brian - I mean I already read most of the articles but it's nice to see another perspective. So sad, but there is still a faint hope... though getting fainter. The newer units, one so far, have a plutonium battery enabling them to ride out the dust storms with ease. Opportunity is worth retrieving because it is a treasure trove of what happens to functional machinery on the surface of Mars after 14.5 years. But those plutonium batteries will never last the 15 years that opportunity managed. Curiosity's RTG could go 10 to 15 years, but is too big for smaller units. Can't find the smallest size RTG could be. The RTG's in space probes weigh around 60 KGs. Being bigger, Curiosity's lifetime supposedly is more limited by mechanical failure. 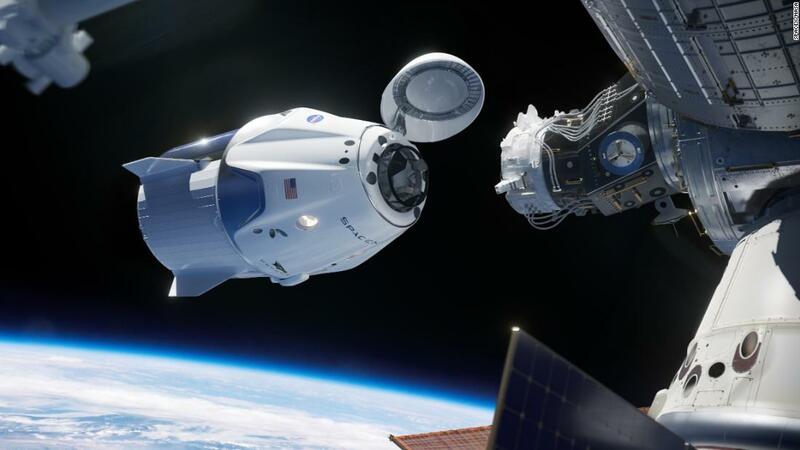 SpaceX's Crew Dragon capsule has been tested in a vacuum, jostled in an acoustic chamber and put through computer simulations. But there's only one way to know for sure how a spacecraft will work: Strap it to a rocket, and let it fly.